I decided I needed to work on my unwatched pile this weekend. Not that I will really make that much of a dent in it considering I have up over 1,000 movies in my unwatched pile. Being the reason I need to work on the pile this weekend! Also the reason why I can't list them all here. So below is a list of films I think I would be interested in for this weekend. I definitely won't get to them all this weekend... probably no where near. My goal for this weekend is 6 movies. Though hopefully I will be able to do even more then that. I will leave the list at that. Though I may still pick some that isn't on the above list as well. As long as I never watched the DVD it is fair game. You might want to save the Feast trilogy for your October marathon. 9 and Cloudy with a Chance of Meatballs should be a Brit and her dad movie day - maybe she'll watch them with you. Clash of the Titans is good but my heart belongs to the original. I have so many unwatched horror in my collection that it wouldn't matter if I saved them for October or not. Though I may. yeah... sure I will watch some with Brittany this weekend. I really enjoyed the original Clash of the Titans too... but I am curious about the remake. Umbrella Corporation's deadly T-virus is spreading across the globe, transforming ordinary people into legions of zombies. Headed for extinction, the human race has just one hope: Alice (Milla Jovovich). She's on a mission, fighting her way through cities and across continents, all inside Umbrella's prime research facility. Old friends become new enemies as she battles to escape and discovers that everything that she believes may not even be true. I have enjoyed all the previous Resident Evil movies... so I was feeling pretty confident going into this one. And I wasn't disappointed. I really enjoyed this one for what it is. A leave your brain at the door, fun... action packed film with just enough of a touch of horror to keep me a happy camper. It is well worth the time put in to watch it. Ryan Pinkston (TV's Punk'd) and Kate Mara (Shooter) star in this hip and hilarious teen comedy about lying to be popular... and living to regret it! 17 year-old Sam (Pinkston) may be the new kid at school, but he's got a sure-fire scheme to fast-track his popularity: he's going to lie his a%$ off! Claiming to drive a Porsche, date a movie star and have a rock-star for a dad, Sam soon finds himself loved by everyone. But when Sam's outlandish fictions mysteriously turn into outrageous facts - he begins to discover that having all your dreams come true...can be a total nightmare! This is a movie I never even heard of before a friend gave it to me. But the trailer looked like a lot of fun so was looking forward to seeing it. And even then it still took me 4 months to finally pop it into the player. Actually two players... the first player I tried didn't like this disc much... but it played perfectly in Brittany's player. Turned out the film isn't bad. Though there is nothing special about it either. Just an average film in my opinion. When Flint Lockwood's (Bill Hader) latest contraption accidently destroys the town square and rockets up into the clouds, he thinks his inventing career is over. Then, something amazing happens as delicious cheeseburgers start raining from the sky. His machine actually works! But when people greedily ask for more and more food, the machine starts to run amok, unleashing spaghetti tornadoes and giant meatballs that threaten the world! Now it's up to Flint, with the help of weather girl Sam Sparks (Anna Faris) and Steve, his talking monkey assistant, to find some way to shut down the machine before the world is covered in super-sized meatballs! I decided to watch this one with my daughter today. It is the first time I seen it... but she has seen it before. After watching I will say that I enjoyed it. Would say it is above average. Though I have seen better animated films lately. But this one is definitely worth the time put in to watch it. It has it moments where it really draws in my attention... but then again there was also times where I got easily distracted from the film as well. I am planning on that one. Looked good by the trailer. But I am taking a small break from movies. Will probably get back to it either this evening or tomorrow. Watching a few episodes of HawthoRNe right now. You should give this one a try Pete, I know you don't like subtitles but it really worth the effort. Thanks... been going back and forth on those films because of the subtitles. I vote for Forbidden Planet. 100% agree. This film got me interested in Asian cinema and essentially cost me thousands . Skip the second though, it's crap. I just watched the DVD out of the DVD/BD Combo Pack. Unfortunately for some reason all the extras are on the BD disc alone... nothing at all on the DVD. I found the movie itself to be simply amazing. Even more so considering it is based on a true story. I was drawn in from the very beginning... and it kept my complete attention till the very end. A real feel good movie. One I couldn't recommend high enough. An excellent story that is wonderfully done. I just finished this film... and I already feel like I could watch it again. If that isn't a sign of an excellent film... I don't know what is. 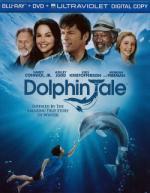 I watched Dolphin Tale on my laptop this morning because... well... I was just to lazy to deal with getting up and putting it into the player when it was right there next to me and my laptop. Anyway... because of this I went ahead and did a bunch of Vidcaps for DVD Profiler's gallery.... and thought I would share with anyone that wanted them.